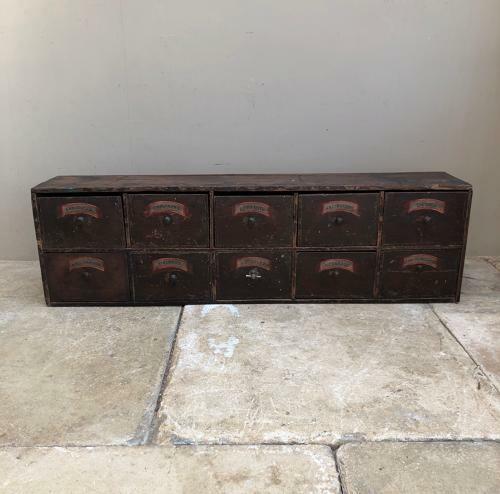 Victorian Pine Bank of Ten Apothecary Drawers. Original Paint. As rescued from a workshop...these drawers are wonderful wall hung and the top used as an extra shelf...or they will sit on a piece of furniture or worktop etc. One knob has been changed...and the labels although Mid Century have been put over the Victorian ones. The back was originally a wall and at some point two wood strutts have been added to the back to hold the drawers in & these strutts are great to add hooks to if you want to wall hang.